Last night we decided to go out for St. Patti’s. I’m tired as hell as we both had to get up early, but we had to see what was what. We had to. We ventured to Jakes – the one with the big crab on top as they have had banners advertising their St Patti’s day extravaganza since we got here. Or maybe they never take them down. Anyhow, we arrived to see about 6 white tents wiggling a “NOW that’s a party 2011” dance mix. The cover was $10 and it was cash only. I mean – who listens to Michael Jackson’s “Billie Jean” on St. Patti’s. NO. That is a FAIL. You are SUPPOSED to pretend to be of Irish descent. You are SUPPOSED to sing Irish songs, dance Irish jigs and in attempts to sound Irish – talk like a pirate. There were 5 of us and not one was in the mood, so we ventured to McMenamins’ Annex. We had a couple of drinks and many laughs – then our exhaustion kicked in and like a bunch of old farts, we joined a chorus of yawns and left. It was a happy St. Patti’s though. I had fun. Had this little ditty at Scandal, a very friendly guys bar in what apparently was or is known as the “Pink Triangle.” Take a guess why. We went there to watch RuPaul’s Drag Race (best show ever). When we get there, people are singing fairly awful karaoke, and we were two of the four women in the whole place. I ask the bartender, “what time does Drag Race come on?” He says, “Oh, well Glee wasn’t on tonight so we moved Drag Race up. Now, we’re having Drag-eoke. 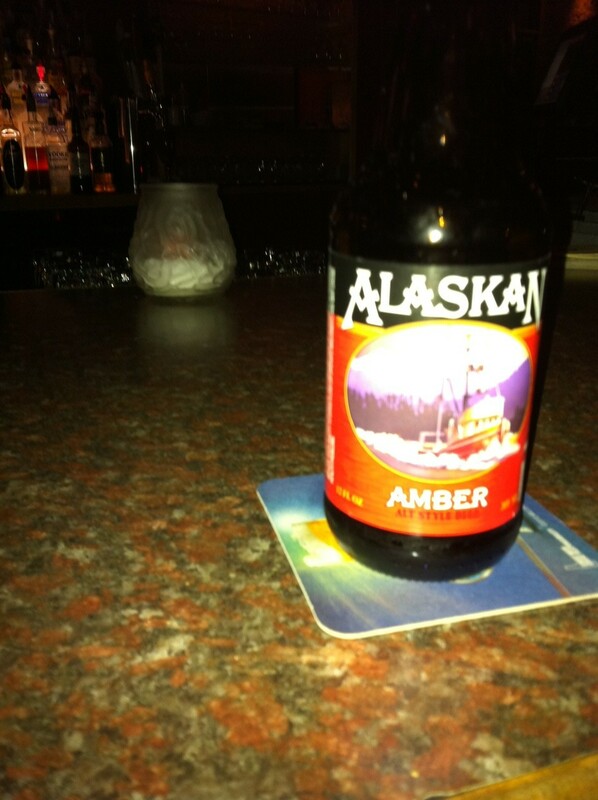 What can I get ya?” “Um…well.. I’ll have that Alaska Amber.” Awesome. Drinkability: Yes, it has some of that. I could have two. Not three. Tastiness: A little thicker than a typical amber ale. A bit nutty too. Pretty rich, but not chocolate ice cream. A bit malty. Color: Dark Caramel, I think. The bottle is brown. I mean, how am I supposed to know. Where From: Juneau, Alaska. Across the street from Russia. Drink Again: Yes, but not after I try everything else. PS. Sorry about the lousy image quality. It was the best I could do under the circumstances. Not to mention how awkward it was when the flash went off. On the very first night we arrived, Pee Wee, the name we’ve lovingly given to one of our concierges, told us if we were hungry we should go a block down to Jake’s Famous Crawfish for happy hour. We’re thinking, we’re hungry… not thirsty. Then, over the course of the last week a dozen people have told me to go to Jake’s. I pass by it all the time; seems unassuming. A regular seafood bar/restaurant. So, late yesterday we decide to hit it up. We had intended our Sunday to be lazy followed by a food cart exploration (a must in PDX). Of course the carts are closed by Sunday afternoon (or they never open on Sunday’s, we just don’t know). Backup plan: Jake’s. We go in an it looks a bit like McSorely’s Ale House but classed up with white waiter coats, original antique finishes (it is apparently the second oldest bar in the city), and smooth elevator jazz. All of that topped off with St. Pat’s banners and a formal wooden countdown to the main event. A pub/seafood restaurant with an identity complex, indeed. They carried only local beers (there are no bad ones. this is a major plus). I get a Rogue Dead Guy, an old standard of mine, and then we peer at the Happy Hour menu. No drinks, just food. Apparently, most, if not all bars have really good happy hour food menus. Apparently an old law wouldn’t allow bars to promote cheap booze, so bars would lure people in with at-cost food. And they still do. Not just crappy stuff either, I tell ya. I ordered the fish tacos (excellent) for 4 bucks; Kate’s gets a chicken quesadilla for 2 bucks. Never in Manhattan. My yenta side perks up at this fact. 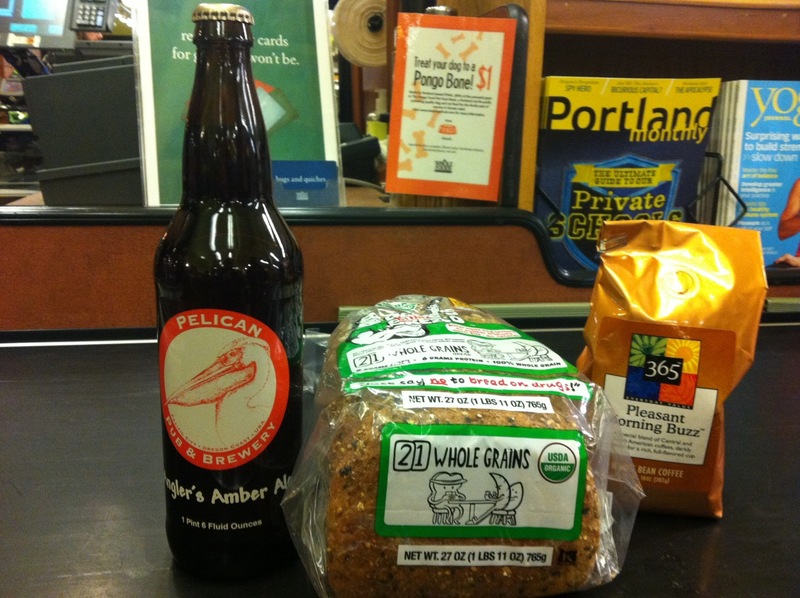 So, for under $20 bucks (literally under 20, no sales tax here – reason 2), we eat dinner topped off with some killer local brews. Never thought I could save money by dining out. Hooray. While I’m here, I might as well try everything. And here, they have fantastic brews. Stay tuned for my entirely biased opinion. Finish: Smooth with a crisp, slight floral bite at the end. Where From: Oregon, of course. Drink Again: Yes, but not after I try everything else. Story of my life. PPS. To clarify, this is not my first brew in the city. I’m only now getting around to logging. Also tried: Full Sail’s Bump in the Night (a little too bitter for my taste), MacTarnahan’s Amber Ale (yum yum yum and local), Fat Tire (been there done that never get tired of it). Also, tried the Green Lakes Organic at the Deschutes brewpub. Good, nothing to write home about. They did give us a couple free pint glasses to take home. So there’s that.